The Zulu word "Thulani" stands for tranquillity, peace and balance. You will find the paradise and many other comforts in our award-winning guesthouse. The Thulani River Lodge is surrounded by 8000 m² of beautiful garden, through which a small romantic stream stretches. 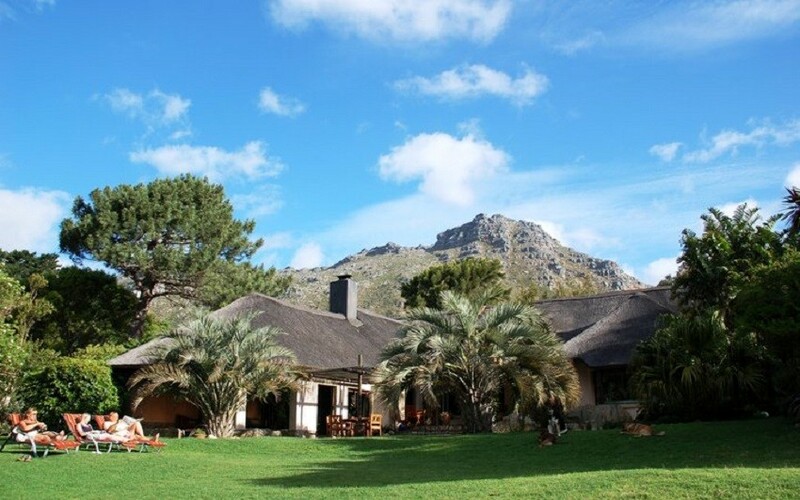 The centrally located guesthouse impresses with its thatched roof, its modern African ambience and its superb outdoor swimming pool made of natural rocks. The guesthouse is built in harmony with nature out of natural materials, such as Balauwood, antique railway-sleepers and slate floors. The accommodation consists of spacious and elegant en suite bedrooms and suites, each with full modern facilities. The bathrooms are spacious and luxuriously equipped with a large shower or shower and corner-bath, a range of amenities and a hairdryer. Each room is held in a modern African style and has its own balcony or terrace with a spectacular panoramic view of our garden, 12 Apostles or Table Mountain. A romantic Honeymoon Suite is also available. It is next to the outdoor swimming pool and offers a beautiful bedroom with an adjacent dressing room. Its luxury bathroom commands a shower and a reeded corner-bath with a view of the 12 Apostle Mountains, which cannot be outbidden with romanticism. A stylish lounge and a cosy fireplace are the perfect place to unwind at the end of the day while watching the beautiful sunset. Our exquisite breakfast buffet - which you can enjoy on the large terrace by the pool leaves nothing to be desired. Of course, we provide safe parking on the premises. From the airport, take the N2 towards Cape Town. Change at exit 6 onto the M3 to Muizenberg / Kirstenbosch. our house on the right side. The Deluxe-Double is stylish with African flair and equipped with a kingsize-bed. From your private, comfortable equipped balcony you have a wonderful view over our garden with the romantic river runs through. The ensuite bathroom is complete with a spacious shower; a lovely hand crafted basin, a range of selected amenities as well as a hairdryer. Coffee and Tea facilities will be provided in the room. The exquisite breakfast buffet - which you can enjoy on the large terrace by the pool - is included. The River-Double for two persons is a lovely equipped room with a king-size bed. The ensuite bathroom with shower over bath or walk in shower and hand crafted basins offers a range of selected amenities as well as a hairdryer. From the wooden deck with its comfortable wicker couches you have a breathtaking view of the garden and the surrounding mountains. The exquisite breakfast buffet is included - which you can enjoy on the large terrace by the pool. Our family-suite consists of a large double-volume main bedroom with thatched roof with four-poster-kingsize bed, overlooking the pool, garden and the 12- Apostel -Mountains, additional bedroom with a double bed , large dressing area, large ensuite bathroom with reeded corner-bath, oversized shower, two handwash-basins and separate toilet. The Deluxe Family room is a spacious, gentle room for up to four persons, equipped with African style. The ensuite bathroom is complete with shower and corner-bath, a lovely hand crafted basin, a range of selected amenities as well as a hairdryer. Coffee and Tea facilities will be provided in the room. Your comfortable equipped private balcony has a view of Table Mountain. The exquisite breakfast buffet is included - which you can enjoy on the large terrace by the pool.